Wisteria has a special place in my list of favourite plants. A large, mature wisteria in full flower is really something to behold. I don’t know where my fascination for wisteria comes from, maybe it’s the magic of seeing seemingly dead wood suddenly sprout long, pendulous racemes of heavily scented flowers, before any leaves have appeared; a veritable waterfall of flowers. I bought a wisteria soon after I started gardening. 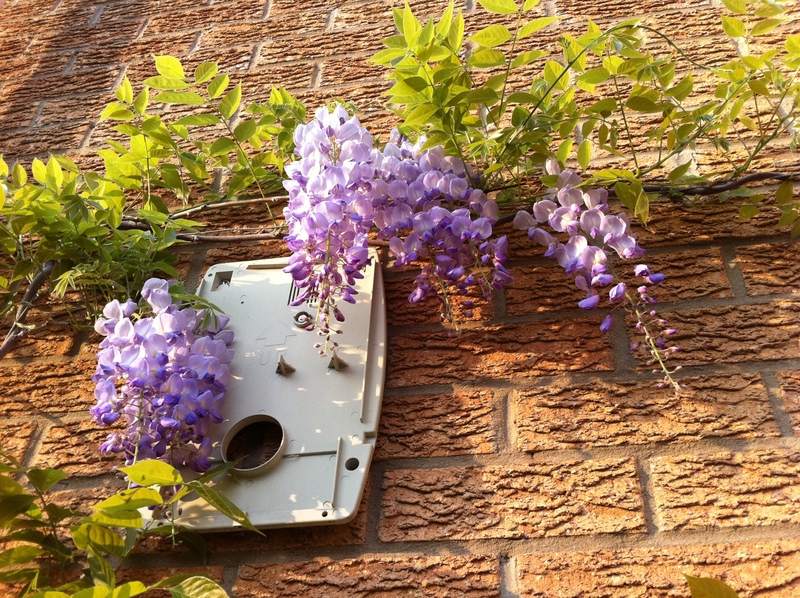 Since wisteria needs to bake on a south-facing wall, there was only one place it could go – beneath the kitchen window in the extension. Being in Cambridge and seeing wisteria that has been growing on the face of colleges and buildings for many tens of years, seeing how thick the trunks can get and how high it can climb, a wooden trellis is all but useless for these plants. They need heavy-duty support so we put metal eye hooks into the wall and used thick galvanised wire. Wisteria will only get heavier and heavier as it grows and the worst thing is to have its support fall from a wall under its own weight after many years. Our wisteria was planted around April/May in the prepared border. Once it was in, all we had to do was to occasionally wrap the running shoots around the wire and ensure it was well watered to get it established quickly. I didn’t know it at the time, but wisteria sold at garden centres will be grafted onto a rootstock. This is so that the wisteria flowers after a couple of years. You can grow wisteria from seed or buy seedlings that are a few years old but be prepared to wait up to 20 years – depending on the variety – before it matures enough to flower. Grafted wisteria can have its own problems too. The graft can fail, either spontaneously by itself or through disease setting in at the graft. Look closely at young wisteria and you should be able to see where it has been grafted (you’ll see a diagonal scar line at the join). If you’re planting wisteria, keep the graft above the soil (easy unless you bury the plant) and don’t damage it; support it well otherwise the graft could weaken and split with the movement of the plant in wind. On my wisteria I have noticed new side shoots emerging from the main trunk below the graft level. These should be removed as these shoots are from the rootstock and is not the growth you want – you shouldn’t encourage these to grow otherwise the rootstock will end up outgrowing and replacing the wisteria that was grafted onto it. Having just planted the wisteria the previous year I wasn’t holding out hope of it flowering after just one year but it did produce two small flower racemes in the spring. They were close together in the place where it gets the sun for longest (not a co-incidence). You can see from the leaves that this spot is in the upper left corner where the white drain pipe runs down to the ground. 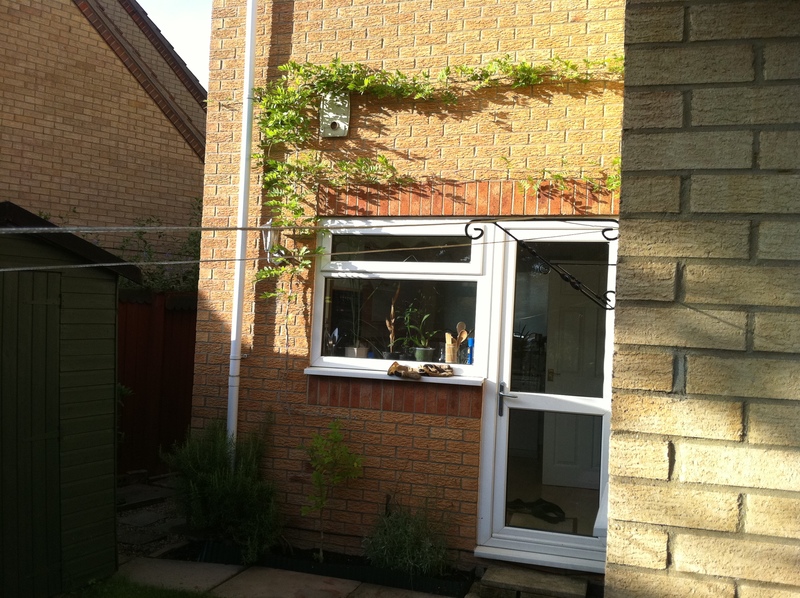 By August the wisteria had managed to go around the kitchen window. It was still looking a little threadbare along its length but this is because all the growth is concentrated at the tip of the leading shoots. When training wisteria, keep the leading shoots growing until they reach the end of the support and when they have gone as far as you want them to, then cut off the tips. This will encourage the wisteria to bush out. It will still be a few years before our wisteria will reach the end of its support so we’re still keeping the runners growing. The wisteria produced several more flowers this spring but it is still a very young plant as wisterias go. We counted about 15 flower racemes and it will still be a few years before there will be too many to count. With the recent two harsh winters the, leading shoots have died back to older wood but new side shoots have emerged close to the ends that has allowed us to continue training the wisteria along the wire. This is the year the wisteria went “floribundant”. I was absolutely over the moon to see the profusion of flowers right along the whole length of the vine. The flowers opened in a wave starting with those closest to the base and spreading right to the end of the runners. The whole show lasted the best part of two months and what the picture can’t give you is the gorgeous scent that that seemed to just cascade off the flowers. If you’re stood where I took this picture, you don’t even need to sniff the air, you can smell it by just breathing. Absolutely wonderful. Unfortunately, the season turned out to be high in rain, low in sun and it was well into summer before the vine really started to throw out new runners. Towards the end of the season, there were enough new long shoots to add a third level to the horizontal wire run and tie them in. It now takes a long ladder, good balance and a strong heart to manage the wisteria. I hate going up the ladder to trim and tie-in leading shoots, but it is worth it. The winter was long and drawn out and there was heavy snow in March so the wisteria didn’t really wake up and get going until late spring/early summer. The flowering was three weeks later than last year and although there isn’t quite enough strength in the vine yet to make the flowers come out all at once, there were countless flower buds from end to end. This year’s tally would blow last year’s out of the water and as always, it was such a joy to behold. 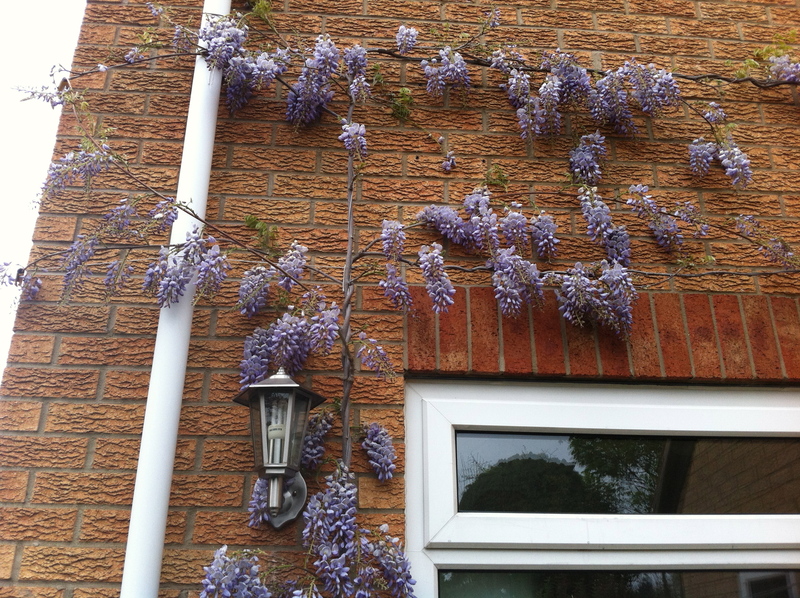 This was also the year when the wisteria would finally make it round the corner to the patio doors, growing longer than before. Towards the end of summer another climb up the ladder revealed that it had grown some very long shoots that were used to bulk out the existing trained runners. 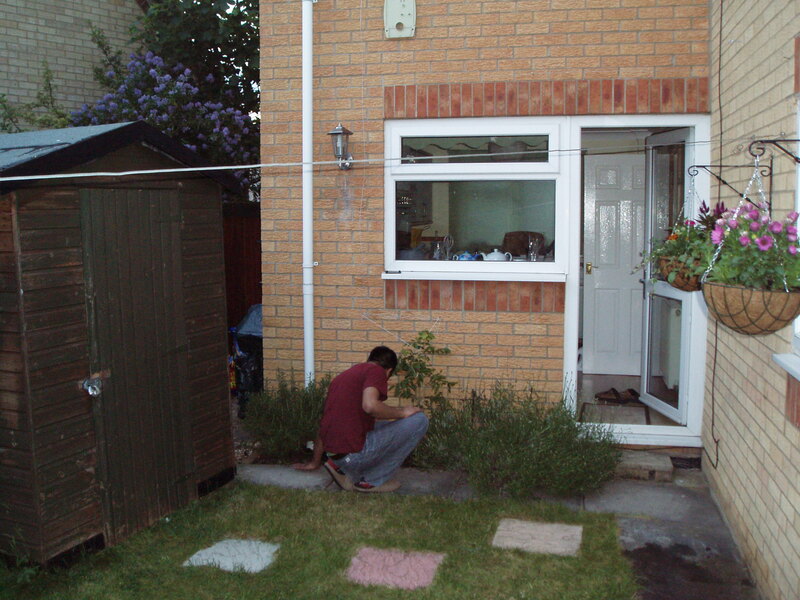 This was the year we moved house and with deep sadness, had to leave my beloved wisteria behind. We left before it put on its annual spring show. I hope the new owners continue to maintain and enjoy the maturing wisteria they now have. After having planted it, cared for it and watched it grow for five years, I will be starting again with a brand new wisteria to train on a brand new house. The story of the new wisteria will be told on my blog instead of continuing this page. I hope to care for and enjoy this second wisteria for many years, which would make a single web page dedicated to it very long indeed.